Is there a way to get students to love math? Dr. Judy Willis responds with an emphatic yes in this informative guide to getting better results in math class. Tapping into abundant research on how the brain works, Willis presents a practical approach for how we can improve academic results by demonstrating certain behaviors and teaching students in a way that minimizes negativity. 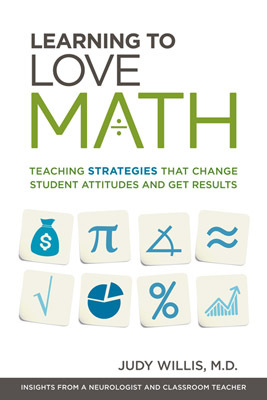 Improve deep-seated negative attitudes toward math. Plan lessons with the goal of “achievable challenge” in mind. Reduce mistake anxiety with techniques such as errorless math and estimation. Teach to different individual learning strengths and skill levels. Relate math to students’ personal interests and goals. Support students in setting short-term and long-term goals. Convince students that they can change their intelligence. With dozens of strategies teachers can use right now, Learning to Love Math puts the power of research directly into the hands of educators. A Brain Owner’s Manual, which dives deeper into the structure and function of the brain, is also included—providing a clear explanation of how memories are formed and how skills are learned. With informed teachers guiding them, students will discover that they can build a better brain . . . and learn to love math! "Willis hits a home run when it comes to helping teachers get students excited about math…. I was impressed with this book. It gave me much to think about. I saw things I do well and other things where I thought, ‘DUH! I should have drawn that same conclusion.’"
—Cossondra George, middle/high school special education and math teacher, Newberry, Mich.
JUDY WILLIS was the first woman graduate from Williams College. After graduating Phi Beta Kappa, she attended UCLA School of Medicine, where she was awarded her medical degree. She remained at UCLA and completed a medical residency and neurology residency, including chief residency. She practiced neurology for 15 years before returning to university to obtain her teaching credential and master's of education from the University of California, Santa Barbara.